New horror film Chernobyl Diaries see six tourists hire an extreme tour guide who takes them to the abandoned city Pripyat, the former home to the workers of the Chernobyl nuclear reactor but during their exploration, they soon discover they are not alone. Drawing from real-life events it had the potential to be truly frightening but unfortunately it does not live up the hype created by the trailer, although the film is rather jumpy in places the story was pretty much nonexistent, the characters were shallow and unbelievable, and the only one who had any substance was one of the first to die, leaving the rest to make frustratingly stupid decisions. The camera work of the movie is chaotic; many of the shots are just too dark to be able to see around the characters leading to confusion as to what exactly is going on. However the location is one of the only bright spots of the movie; it provides a creepy atmosphere and helps build tension, the dark, narrow tunnels, the dust and the old abandoned equipment, are one of the only things that saves an otherwise predictable disappointment. A brilliant horror that sees Annie come back to her childhood home when her sister disappears after organising their mother’s funeral, which she was determined not to attend due to years of childhood abuse but soon strange, supernatural things begin to happen to her. This is a very clever plot which takes you on a journey, uncovering things as Annie does. The acting was very believable and unlike some horrors followed what the true behaviour of normal people, running to the cops instead of going it alone. Despite many thinking she’s crazy, one cop (who is rather good looking) decides to help her, and they start investigating the history of her family and the house that hides a more terrifying secret then anyone could imagine, all revolving around the cupboard Annie and her sister were locked in as children. The soundtrack, or lack of it, created a very eerie, real and intense atmosphere which keeps you on the edge of your seat; the characters individually weren’t particularly out of the ordinary, except Stevie, a blind pshysic from Annie’s teenage years, who gives her the help she needs to discover the shocking truth of her families past. The twist is scream-inducing leads to an ending you could never see coming. This film is an intelligent, well written and acted, proves that the things that go bump in the night are not always in your imagination. Definitely a must see, just maybe not alone. A fantastic romantic comedy that everyone can enjoy. Tom is a long-time chef in San-Francisco, he believes he is destined to spend the rest of his life with his girlfriend, Violet, a British psychology post graduate student, so after only a year since they met, in what were hilarious circumstances, Tom proposes. The chemistry between Segel and Blunt is magnificent, portraying a completely believable relationship, they are supported by a great cast including Tom’s best friend and former cook buddy Alex who is very funny with his constant irritating, childish behaviour! To make matters worse for Tom and Violet, Alex marries Violet’s sister, Suzie after getting her pregnant during a one night stand at their engagement party, causing jealously as Tom and Violets wedding keeps getting delayed, much to their families disappointment. The trouble really starts when Violet receives an invitation into what is a once in a life time job opportunity in snowy Michigan, leaving Tom searching for a new job. Unfortunately he ends up working in a fast food sandwich shop and slowly we see Tom begin to lose his touch with reality out in the Michigan wilderness with his eccentric crew of new friends, while Violet becomes increasingly close to her boss, the charming Professor Winton Childs, leaving them to wonder if their destinies are really interlinked. This is a great film and shows that relationships don’t always run smoothly as plenty of other films would have you believe, it is relatable and has moments of pure comic genius, if the Elmo-Cookie Monster scene doesn’t have you laughing there is something wrong! Although the film does drag in some places, it could’ve been easily done in 90 minutes; it is well worth a watch and will have you believing that love can conquer all. It’s been three years since the second Ice Age sequel, Dawn of the Dinosaurs, and the writers have put those years to good use. Continental Drift is a breath of fresh air to the franchise, because this time they’ve managed to reach out to not just parents and young children, but teenagers as well, whilst maintaining that cute sense of fun and comedy that has kept the whole thing afloat all this time. You’ve still got your original characters: Manny the mammoth, Diego the sabre-tooth tiger, Sid the sloth, and – how could we forget – Scrat, who has a significant part to play in the story, as usual. There are also a lot more new characters this time: a motley crew of pirates (Nick Frost provides the voice of an elephant seal, and Jennifer Lopez is Shira, another sabre), and Sid’s sassy Grandma, but the teenage appeal comes from Manny and Ellie’s daughter, Peaches. Many teenagers can identify with her, as she just wants to fit in, feels rather embarrassed about her ‘half-possum, half-mammoth’ family, and wants Ethan (a mammoth voiced by none other than hip-hop rapper, Drake) to notice her. But being the overly-protective father that he is, Manny tries to stop her from doing anything exciting in her life, and they fight…just before the continental shift splits him and his friends up from the family. This is not the best film from the franchise, but it’s not bad. The pace of the plot seems slow at times, but the continuous flow of one-liners and cheeky humour keeps things going, and the kids will be amused as always, with Scrat and his endless quest for that acorn of his. Come the end of the film, you get the sense that this franchise could just keep on going and going – who knows? It might end up like Saw, and get up to six films before the kids get tired of it. 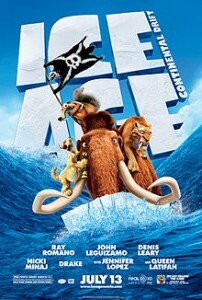 Listen out for the voices of Nicki Minaj and Glee’s Heather Morris as mammoths. The last time this superhero thwipped his way onto our screens, it didn’t go so well. Spiderman 3 had too many villains (and then there was that haircut) and was met with a lot of critical disappointment, and furthermore, plans for a fourth sequel were scrapped. Which was a shame really, because the first two films were actually quite good. But with the film industry still chugging healthily along with plenty of other blockbuster sequels and reboots to keep us amused (Nolan’s Batman franchise immediately swoops into mind), it was only a matter of time before Spiderman got another chance at success. The Amazing Spiderman finally gives us an insight into why Peter Parker lives with his Aunt and Uncle. His parents were scientists who mysteriously disappeared when he was very young, and when Peter discovers a briefcase in his uncle’s basement, it leads him to Oscorp laboratories. Here, he meets Dr Curt Connors (Rhys Ifans), who happened to be his father’s partner before he vanished. Connors studies reptiles, and hopes to use their cells to rebuild himself a new arm, after losing it in a war…with terrifying consequences. Andrew Garfield slips on the infamous mask, and this time, that cheeky alter-ego really shines through. The other difference with Garfield’s Peter Parker is that he can cry without looking pathetic. I know that sounds a bit harsh, and though I liked Maguire’s interpretation, Garfield brings him well out of just being a total geeky wet blanket. He designs his weapons himself, as well as a switch-powered lock on his bedroom door, yet his awkwardness around girls shows he is just like any other kid in school, complete with (yes!) a skateboard – and he certainly knows how to use it. He’s also a nice kid who works hard in school, and has to put up with the bullies; I think that’s why we like him so much, because he’s just an ordinary guy, trying to get through life…just with some extra abilities! Unfortunately, we are subjected to seeing his beloved Uncle Ben (Martin Sheen) being shot (again), though the back story behind it is quite different to the other one (good). Marc Webber has clearly done his homework with this film, though. There are many scenes that seemed to have come straight out of the comics. One example is in the sewers: Parker is sat on a web, strung up to each of the walls when suddenly, something plucks at one of the strings, then another, then another…and he realises there are lizards crawling towards him. Emma Stone (The Help, Easy A) plays his love-interest, Gwen Stacey (not Mary-Jane!). Garfield and Stone are actually a couple in real-life, which may explain why their banter was so natural, albeit while being incredibly, adorably awkward at times. Watching Spiderman swing through the streets of New York blew my eight year old mind in 2002, but watching it now, you can blatantly see the use of CGI (and don’t get me started on the part where he climbs a wall for the first time). 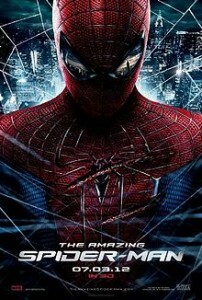 The same can not be said for The Amazing Spiderman. It looks real, in fact, most of it is real, from what I have seen from a special feature about it on Channel 4, and the clever use of light and shadow make for a very authentic wall-climbing scene, though it is rather brief, because Peter is too busy fighting some thugs to stick around (hee hee) for long. This film is a new (almost) fresh look to the Spiderman story, with a villain who is not all bad and gets most of the CGI, which is a relief.